In Tools and Hardware > Show & Tell and Kitchen > Show & Tell. This is about 4''x6'' and 11'' tall. I picked it up at a thrift store and they had no idea what it was. ANY help would be MUCH appreciated! They would have to be VERY small bottles! Wouldn't the plastic on the handle melt in the dishwasher? 1. The racks are offset mounted to the base, not DIRECTLY to the handle, leading you to think there was a larger amount of weight on the forked side. 2. The non "rack" side has two sets of thinner slits that are parallel, like a knife could slip into it. I'm pretty positive it has nothing to do with bottles... bottle carriers have more of a bottom to support the weight of the units, and use crossbars to prevent them from hitting one another. as well... that would not explain the one sided rack. Any idea that has NOTHING to do with bottles? 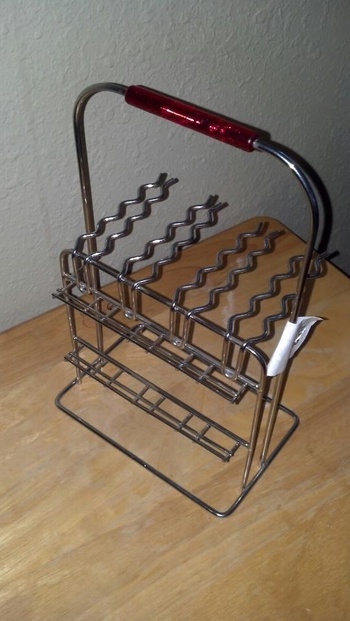 flatware caddy . here one on ebay ..